Cute meets extremely deadly! 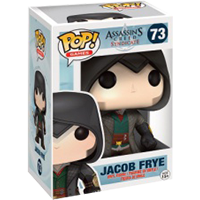 This Assassin's Creed Syndicate Jacob Frye Pop! Vinyl Figure features the assassin from the continuation of the hit video game franchise, Assassin's Creed! Packaged in a window box, this Pop! figure measures about 9 cm tall.